I'm a fan of any cocktail that involves champagne or sparkling wine. My normal go-to is a french 75, but I've been searching for a cocktail that is more seasonally appropriate. Like I said in an earlier post, I've recently gotten into bourbon and find this cocktail to be especially tasty. Although I'm not quit ready for a holiday themed cocktail, I do want something a little seasonal. This drink could work for both holiday parties or for a date night at home (which is what we ended up doing). Plus, when Trader Joe's has sparkling wine on sale, how can you not pass up a bubbly cocktail? Combine bourbon, orange liqueur, and bitters in a cocktail shaker filled with ice. Shake until cocktail shaker is frosted over. 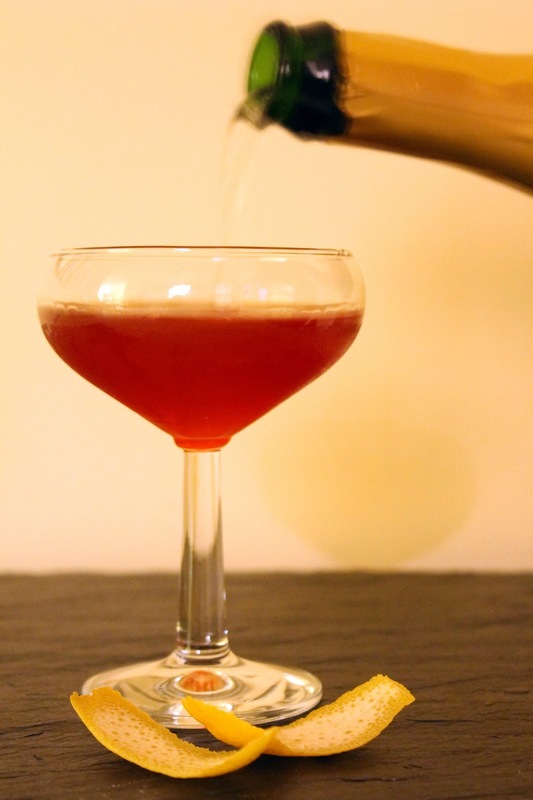 Strain into two coupe glasses and top with chilled sparkling wine. Garnish with an orange twist if desired.